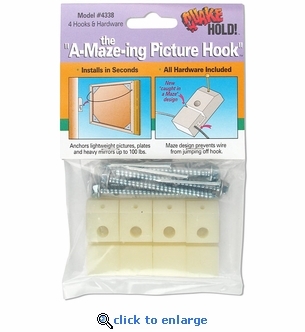 The A-Maze-ing picture hook prevents pictures, mirrors and other wall hangings from jumping off the wall hanger hook in a moderate earthquake. These picture hanging hooks are truly amazing because the picture hanging wire wraps through a maze that keeps the wire and hook joined together. Be prepared. Don't let a minor earthquake ruin thousands of dollars of frames, mirrors and paintings. Includes 4 hooks and hardware. Unique feature traps picture wire in a maze. Use one hook for items 50 lbs. or less.